Otoplasty is one of the most common plastic surgery procedures for children. The majority of patients who undergo otoplasty are between 4 and 14 years old, according to the American Society of Plastic Surgeons, although many adults also elect to have the procedure. Ear surgery can correct protruding ears (excessive ear cartilage), large or otherwise deformed earlobes, "lop ear" (where the ear tip bends down and forward), and "cupped" or "shell ear" (which could be a very tiny ear or an ear without natural creases). Today a select number of surgeons have developed techniques to create ears for patients who are missing all or part of their ears as a result of a birth defect or traumatic injury. For total ear reconstruction, otherwise known as congenital microtia (ear absence), a common approach begins with developing a framework from the ribs, then elevating the back, and placing a skin graft. 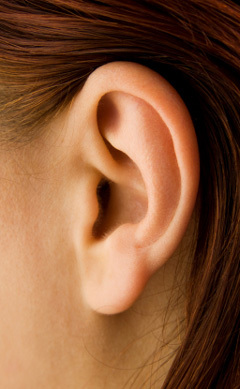 The ear canal is then carved out — often it is necessary to rotate the lobule. Ears that are malformed due to trauma (including burns) may undergo a variation of the reconstruction process, possibly with more extensive skin grafting, depending upon the extent of the tissue damage. Young patients are often required to refrain from normal activity for at least seven days after surgery. Special care must be given to children throughout the first three weeks of recovery to restrict them from playful activities that may disrupt the ears. Adult patients usually return to normal activity within three days after surgery. More complicated procedures may require a longer recovery time. In all cases, the ears should not be bent for at least a month or more. Complications are possible with any plastic surgery, though they are rare with otoplasty. Complications can include a blood clot on the ear or infection in the cartilage area. The surgeon may recommend a waiting period to see if the blood clot or infection (with antibiotic treatment) resolves itself. If the blood clot does not dissolve, it can be removed with a needle. Rarely, an infection may require surgical drainage. Scar tissue formation is a possibility. Many patients may have a slightly visible scar on the back of the ear. However, surgeons take special care to place the incision in an inconspicuous location.